As I’ve made clear in several other posts: I. Love. Pancakes. Anyone around me during mealtimes can attest; I eat pancakes for lunch or dinner at least 3 times a week. With these delicious little cakes frequenting my meals quite often, I like to try new twists to the classic pancake to keep things fresh; today I want to share with you a wonderfully fruity version, the strawberry pancake. I came across this recipe on Food Network and had to give it a try. Light, fluffy, and perfectly sweet, these pancakes are bursting with strawberry flavor and are delicious eaten with a dollop of whipped cream and extra fresh berries (as shown) or with a drizzle of maple syrup. They truly make the perfect fruit filled breakfast (or in my case, breakfast, lunch, dinner, snack…) Enjoy! Preheat a skillet over medium heat or an electric griddle to 350 degrees. In a large bowl whisk together flour, sugar, salt, baking powder, and baking soda. In a separate bowl whisk together buttermilk, eggs, and melted butter. Make a well in the dry ingredients with your finger or a spoon and pour wet ingredients into dry. Spray your skillet with cooking spray and drop pancakes by 1/4 cup into pan. Drop a few strawberry slices on top of the batter and allow to cook, about three minutes, or until bubbles form on top of the pancakes and the underside is golden brown. Flip pancakes and cook an additional 2-3 minutes, or until golden brown and cooked through. Place pancakes on a plate and cover with tin foil to keep warm; similarly you can also keep warm in a 200 degree oven. Continue making pancakes until all batter is gone. 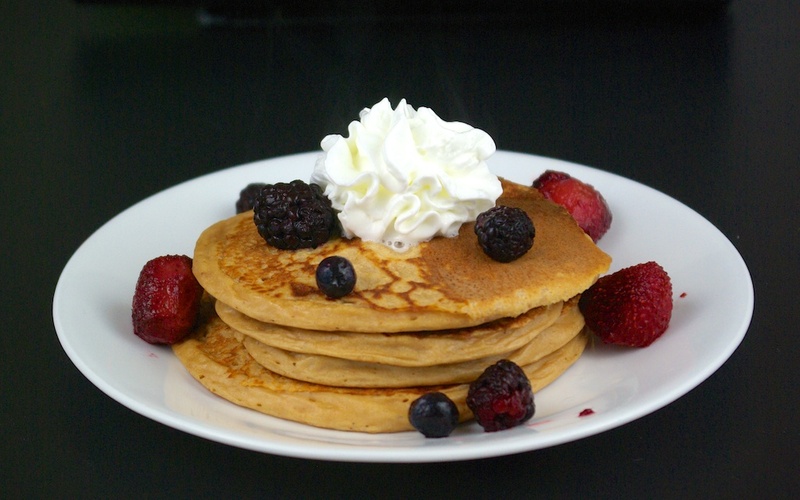 Enjoy topped with whipped cream and berries or a drizzle of maple syrup.